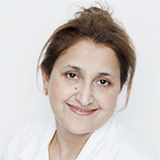 Dr. Sajida Detho is a Consultant IVF, OB/GYN who began her career in Obstetrics and Gynaecology and IVF in 1998. Upon obtaining her Medical Degree, Dr. Sajida worked at Liaquat Medical University Hospital Hyderabad, Pakistan, from 1998 to 2003 in the Gynaecology and Obstetrics Department. She then went on to work at St. James Hospital of Dublin. From 2005 - 2013, she worked at Rotunda Hospital, Dublin, first in the Obstetrics and Gynaecology department and then as a Consultant Reproductive Medicine IVF in the Human Assisted Reproduction department. During her training in Ireland, she gained experience in Natural Cycle IVF/ICSI and had success during the Flare Protocol in IVF/ICSI at the Hari Unit from 2007-2013. Dr. Sajida joined Fakih IVF and Fakih Medical Centre in 2014. Education: Dr. Sajida received her Medical Degree in Obstetrics and Gynaecology from Liaquat Medical University of Health Science Jamshoro Pakistan in 1996. She went on to obtain membership in the Royal College of Physicians Ireland (MRCPI) in 2005 and the Royal College of Obstetrics and Gynaecology London (MRCOG) in 2007. In 2008, she continued her training by obtaining a Diploma in Women's Health from the Royal College of Physicians, Ireland. In 2011, Dr. Sajida obtained her Diploma in Laparoscopy from Kiels University, Germany. During this time, from 2007 - 2013, she pursued her sub-speciality in Reproductive Medicine and IVF from the HARI unit from Rotunda Hospital. Furthermore during this period, she was certified by the British Fertility Society in Pelvic Ultrasound, Embryo Transfer and IUI, Assisted Conception and Sub-Fertility and Reproductive Endocrinology RCOG, Assisted Conception and Management of Infertility Couple.